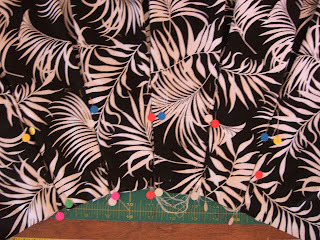 I've had this fabric sitting in my stash since May. I love the weight and bold print but wasn't sure if I wanted a dress or a skirt. I decided on the skirt. I followed the directions and messed it up! The pleats are wrong but I like the way the turned out. I love those flat flower pins. I discovered those at a quilting workshop last fall. They are longer than normal pins and they lay flat which is great when you're trying to mark the fabric. I watched a youtube video on invisible zipper installation and managed to put it in backwards. So there was ripping involved. Eventually I got it all together. I love how it fits and how it feels. I wish I had made it earlier this year! As always please check out Kootoyoo for more fun creative spaces this week. It looks like fun fabric. I love that fabric. It would make an awesome skirt. I haven't sewed clothes for myself since my kids were born but I'm thinking of getting back to it since I don't like how anything fits anymore. BTW, LOVED (!!!!) Hearts on the Road! I'll write a review of it soon. Thank you Jen! I'm glad you liked the book. A review would be great, but it still isn't out at the online bookstores. Not until January. The skirt turned out fabulous. I love, love, love it! I love this. I used to sew all the time when I was a stay at home mom. I made all my daughter's clothes and matching ones for her dolls.